Sabetha 42, Silver Lake – For just the second time in recent history Silver Lake has not reached the 3A state semifinals. Sabetha upset the Eagles 34-28 on Saturday to advance to a quarterfinal match-up with Wellsville. Brock Frey broke a 28-yard touchdown run with just over a minute to go to break a 28-28 tie and lift the Bluejays to victory. Silver Lake’s last drive ended when quarterback Dalton Dultmeier was intercepted in the end zone on the game’s final play. Frey rushed for 142 yards and two touchdowns, but also returned a Silver Lake fumble for another score. The Eagles committed six turnovers in the game. Dultmeier passed for 282 yards and two touchdowns, but was intercepted four times. Wellsville 56, Neodesha 7 – Wellsville scored in each quarter in cruising to a 56-7 at Neodesha. The Eagles built a 35-0 halftime lead and tacked on more points in the second half as the running clock was eventually initiated. Zach Strawn led Wellsville with 262 rushing yards and four touchdowns. Rossville 61, Nemaha Central 20 – Rossville broke open a close game with a huge second half in beating previously-unbeaten Nemaha Central, 61-20. The Bulldawgs scored four times in the third quarter to pull away from the Thunder in building a 49-12 lead heading into the final quarter. Tucker Horak rushed for 328 yards and four touchdowns in the game. He also passed for 210 yards and two more scores. Ryan Hasenkamp led the Thunder with 169 passing yards and two scores. St. Mary’s Colgan 28, Galena 14 – Colgan avenged a Week 1, 7-0 loss to Galena by beating the Bulldogs 28-14 on Saturday. Joe Battitori rushed for 164 yards and scored all four Panther touchdowns in the win. He missed the season-opening game between the Panthers and Bulldogs with an injury. Halstead 48, Wichita Independent 0 – Halstead pulled away from Independent on Saturday by scoring in each quarter in a 48-0 win. Eli McKee rushed for 101 yards and two touchdowns to lead the Dragons. Layke Heimerman added three touchdown runs for Halstead. The Dragons will host Hoisington in next week’s state quarterfinals. Hoisington 50, Washington County 6 – Hoisington turned the battle of unbeaten teams into a blowout as the Cardinals beat Washington County 50-6. Hunter Hanzlick rushed for 182 yards and four touchdowns to lead the Cardinals, while Zade Sanders added 106 yards and two more scores. Wichita Collegiate 41, Garden Plain 6 – The Collegiate defense forced an early Garden Plain turnover and punt while the Spartan offense built a 21-0 lead in rolling to a 41-6 victory. Quarterback Austin Waddell scored the first two Collegiate touchdowns and later added another. 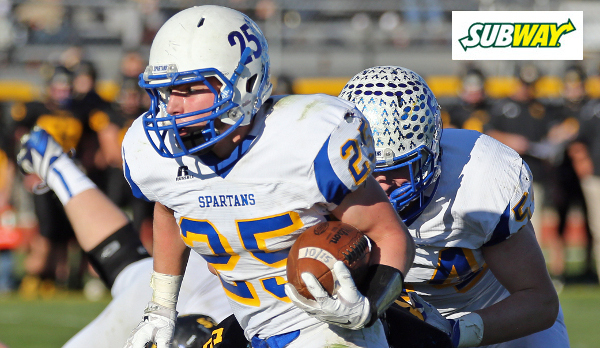 Nathan Burgoyne rushed for 147 yards and two touchdowns to lead the Spartans. Norton 28, Scott City 24 – The Norton Bluejays controlled most of the game Saturday, but found themselves down 24-21 with around 2:37 remaining in the game. The Bluejays drove 80 yards with Jace Ruder hitting Gavin Lively on a short touchdown pass to retake the lead 28-24 with 16 seconds left. Ruder kept the drive alive with a 19-yard scramble on a fourth-and-15 play. Norton jumped out to a 14-0 lead in the first quarter as Lively ran for a pair of touchdowns. He added a third in second quarter as Norton led 21-10. That score remained until the fourth when Cooper Griffith’s touchdown run pulled the Beavers within 21-16. Scott City then took the lead with 2:37 remaining as quarterback Bo Hess heaved a desperation fourth-and-13 pass to Justin Faurot that resulted in a 31-yard touchdown. Burlingame 74, Central Burden 54 – Burlingame outscored Central Burden to advance to the state semifinals where the Bearcats will host Hanover. Burlingame overcame an incredible effort from Central Burden quarterback Lucas McMichael who pulled the Raiders within 40-32 mid-way through the third quarter. The Bearcats would take over from there scoring the next 20 points to pull away. Robert Hutchins rushed for 149 yards and six touchdowns to lead Burlingame, while McMichael passed for 257 yards, rushed for 181 yards, and accounted for seven total touchdowns for the Raiders. .
Hanover 68, West Elk 46– Hanover scored 52 points over the second and third quarters to pull away from West Elk, 68-46. West Elk led 14-8 early before Hanover quarterback Will Bruna got the Wildcats rolling. Bruna completed 27 of 34 passes for 373 yards and four touchdowns on Saturday; breaking the Kansas state record for passing yards in a single season. Bruna has thrown for 3,010 yards and 51 touchdowns, breaking the mark of 2,837 yards set by White City’s Michael Hammersmith in 2000. Bruna’s 51 touchdown passes this season is one short of the state mark of 52 set by Central Burden’s Bo Savage in 2010. He’ll have a shot at that record as the Wildcats take on Burlingame in the state semifinals next week. West Elk’s Armando Gomez completed a brilliant career with 240 rushing yards and five touchdowns. Gomez finished with 1,744 rushing yards and 37 rushing touchdowns this season, and 4,472 yards and 82 touchdowns for his career. Spearville 58, Central Plains 28 – Top-ranked Spearville built a 32-6 halftime lead in eliminating the defending champion Oilers, 58-28. Luke Heskamp rushed for five touchdowns and caught a touchdown pass from back Brandon Davis in the win. Spearville quarterback Nathan Stein scored twice in the first quarter as the Lancers grabbed an early 24-6 lead. Braedan Crites rushed for a pair of touchdowns for Central Plains. Solomon 34, St. Francis 26 – Solomon jumped out to a 28-8 lead in the first half and held off St. Francis 34-26. The Gorillas led 28-14 at halftime before a touchdown run by Garrett Brunk and a touchdown pass from Quinton Cravens to Joel Hill pulled the Indians to within 28-26 in the fourth quarter. Solomon would respond with a Jake Tiernan touchdown run with 3:12 remaining to win 34-26. Tiernan passed for 138 yards and two touchdowns and added 79 yards rushing and two more scores. Axtell 62, Caldwell 14 – The Axtell Eagles shut out Caldwell 38-0 in the second half to advance to the state semifinals for the second consecutive season. Quarterback Colton Buessing rushed for 186 yards and four touchdowns to lead the Eagles. Buessing also passed for 118 yards in the game. Caldwell was led by quarterback Colten Ward’s 106 rushing yards and two scores. Argonia-Attica 74, Pike Valley 24 – Argonia-Attica broke open a close game with 38 points in the second quarter en route to a 74-42 win at Pike Valley. Devon Newberry led the Titans with 129 rushing yards and four touchdowns on 15 carries. Quarterback Alec McDaniel added 93 yards rushing and three scores, while throwing touchdown passes to Newberry and Jacob Norris. Devonte Hammer passed for 203 yards and three scores for Pike Valley. Victoria 46, Minneola 0 – Victoria shut out Minneola 46-0 to advance back to the sub-state semifinal round. Joe Dortland rushed for a pair of first-half touchdowns and the Knights got a late halfback pass touchdown from Brady Dinkel to Parker Riedel to lead 30-0 at halftime. Collin Kisner then returned the second-half kickoff for a touchdown for a 38-0 lead. Sharon Springs-Wallace County 74, Ingalls 58 – On an emotional day in Ingalls, Wallace County outscored the Bulldogs 74-50 to advance to the sub-state semifinals against Victoria. Eric Gfeller rushed for five touchdowns and tossed three touchdown passes to lead the Wildcats. Wallace County led 30-20 at halftime, but took control in a wild second half that saw the two teams trade touchdowns on consecutive kickoff returns.